tldr: click graphic to get exam replay offer. Microsoft have run, at various times over the last few years, campaigns to give exam candidates a “second shot” at passing exams. Why? As Microsoft’s Liberty Munson (Principal Psychometrician for Microsoft Learning) writes: “certification exams are valid and reliable measures of the content areas that they are intended to measure”. Exams will test your understanding of Microsoft’s solutions, not just test how well you memorise and then regurgitate answers. This could mean not passing an exam on the first attempt. Remember, you don’t fail exams; you just haven’t passed it … yet! Enter Microsoft’s latest special offer: Exam Replay. There’s even an offer that gives you a replay on your exam, plus a practice test! This offer gives you an edge, the confidence that you’ve studied and understood the objectives, plus a safety net to stop you crashing if you have a bad day in the test center. Certification is a great validation of what you know, and how you apply that knowledge, it’s the advantage you take into a job interview, the credibility you add to discussions: you’re a Microsoft Certified Professional! Clang!” Bring out your dead!” Clang! “But, I’m not dead yet!” Timeless comedy from Monty Python; it never gets old. Certifications, on the other hand, do have a lifetime – they get old and need to be updated, refreshed. What about my old MCSE?? Your current MCP transcripts are being evaluated; those with active MCSE or MCSD certifications from the following list will be converted to the new MCSE or MCSD certifications for 2016 without having to take any additional exams. The cadence of change, in operating systems, in applications, has to be reflected in certifications. We need to stay current, to stay relevant. The rationalization of the MCSE/MCSD into these five specialities, and the ongoing renewing of those certifications is a great step in keeping up with those dynamic changes. There is a lot more information being released, now and over the next few weeks. A good friend of mine, Larry Kaye, has written an in depth blog post covering more details. Go to Microsoft’s “Born To Learn” and read through it carefully. WIN ICD = Upgrade coolness! 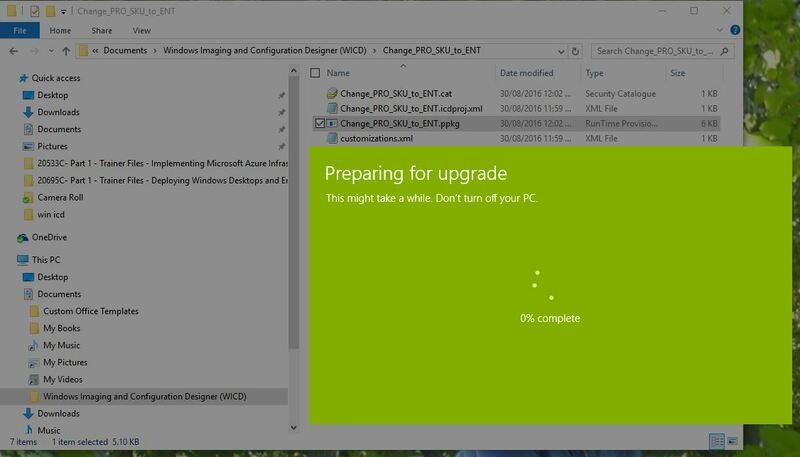 It took me 15 minutes to upgrade my Surface Pro 4 from Windows 10 (Build 1511) Pro to the same version, but Enterprise. Truly simple and straightforward, follow the steps and screenshots below to turn your Pro into Enterprise in a few simple steps. Even better, once you assess the options in the WIN ICD Tool, you’ll realise how effective this will be to deploy to any BYOD, CYOD, or even to an entire organisation’s machines. 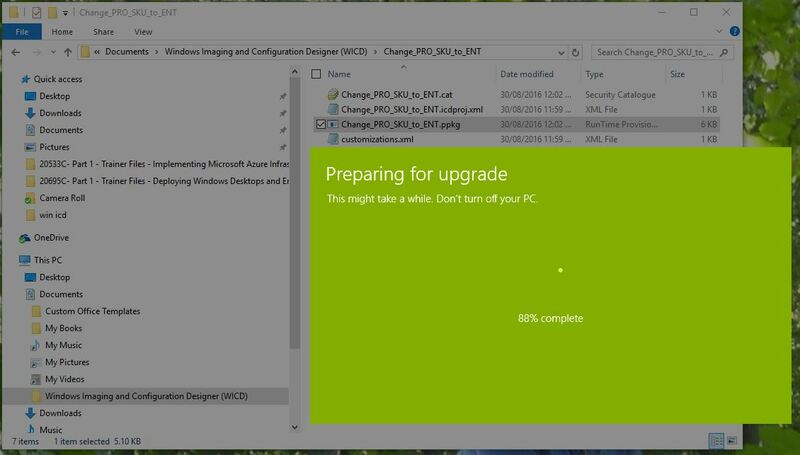 First step: got to the Windows 10 ADK (download here) and install the ICD. Accept the other elements of the ADK, then start a new project. This is where you choose how to rebuild/upgrade. In my case, I entered my Product Key for Windows 10 Enterprise. Have you noticed that new PCs and tablets seem to boot really, really quickly? Compared to your typical work desktop, these devices are up, running, and ready to logon in seconds! No longer is there time to go get a coffee and come back to see the Username/Password prompt flash into existence. How does it boot so quickly? That’s due to the Unified Extensible Firmware Interface (UEFI). Once UEFI is enabled, it allows us to get around the limitations of the Basic Input Output System (BIOS) that has been around in one form or another since 1975. Those limitations included 16 bit processor mode, and being limited to 1 MB of addressable space. 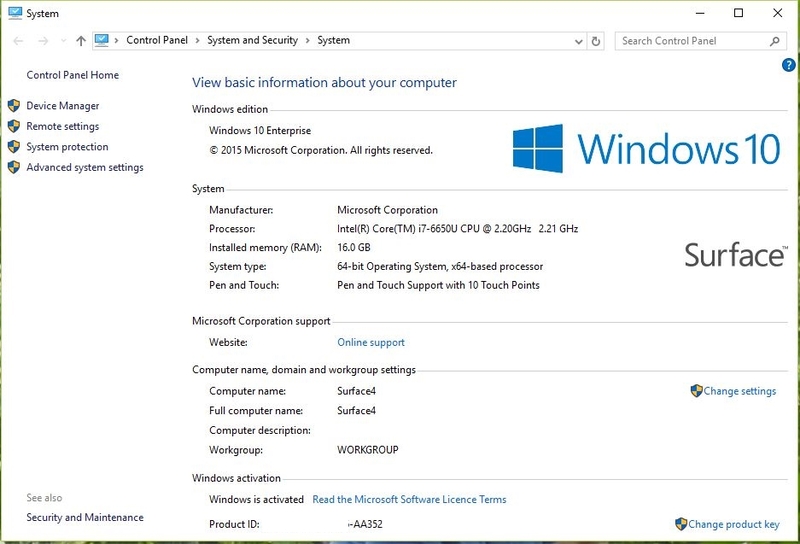 UEFI also uses a newer partitioning scheme, GUID Partition Table (GPT). GPT was designed to extend pass older limits. In this case, Master Boot Record (MBR) is limited to a maximum disk size of 2TB. How does all this fit together? Well, to install a modern operating system (OS), a UEFI bootable device needs to be created. If you’re booting from a Windows 8.1 DVD, and UEFI is enabled in the BIOS of your pc, the required partitions are automatically created. If, however, you’re using the Windows 8.1 iso downloaded from Microsoft, then you need to build a bootable device yourself. This means using FAT32, I repeat, you need to use FAT32, *not* NTFS! The following screen shots and explanations will give you all the detail needed. Read through all the steps first, backup your old OS, then start playing. Once the copy process is completed, you should have a brand new USB FAT32 GPT bootable device. Follow the instructions to enable UEFI boot in your BIOS, reboot using the above mentioned USB and install a really, really fast booting version of your operating system. Even faster if you use an SSD. Good luck, and don’t forget to back up first! Great if you are playing a game of cards, particularly a high stakes poker game, not so great if you are trying to secure your corporate resources. “Man up, and defend yourselves!” said Ex NSA Director Michael Hayden. Difficult, when all our Administrators have a handful of ACEs! Quick revision time: An Access Control Entry (ACE) is found in an Access Control List (ACL). Typically IT Pros refer to ACEs and ACLs, pluralising the acronyms rather than the words. The ACEs in an ACL determine what access rights a trustee has to a securable object. There are two types of ACLs: Discretionary Access Control List (DACLs) that contain Access-denied ACE and Access-allowed ACE, and System Access Control List (SACLs) that contain System-audit ACE. So DACLs grant or stop resource use, SACLs track who or what succeeded or failed that usage. So how do we regulate what ACEs our Administrators hold? After all, they’re Admins; and by definition we totally trust our Admins, we have to! “Pardon Mr Snowden, you’re leaving?? But …” We do not, we can not trust our Administrators to hold all the top cards any longer. It’s not a personal issue, a lot of administration is automated; click a button on a web page and you can provision an entire Active Directory (AD) environment in Azure in a matter of minutes, literally. Organisations, corporations, governments, the local optometrist, all need a method of abstracting the necessary permissions – the ACEs – from the physical persona of the Administrator. For both the sake of the Admin, and his area of responsibility, let’s find a method of taking all the picture cards (including ACEs) away from Admins and only giving them Just Enough Administration rights to carry out their assigned tasks. Without any more fanfare, let’s introduce JEA. Just Enough Administration (JEA) is a recent release of a Windows PowerShell Desired State Configuration (DSC) resource and configuration script that constrains administrative rights and permissions on both local and remote servers. In essence, any commands an Admin wishes to run on a server will run in a local administrative context, restricted to a subset of commands, and only for that session. Brilliant! I can now, through the use of the JEA Toolkit, chose what modules, what cmdlets, and even what parameters can be used for each Administrator, for each session, for each server! And, most importantly, through the SACLs, audit success and failures for every resource. As you can see, in the screenshots below, I can choose the modules, the security group, and then read the script to ensure I get the correct configuration. This is just scratching the surface of what is available in JEA. For how to configure, manage, and create the JEA Endpoints used in constrained delegation, follow the links to download, read, and implement what will become the standard for administering your servers in the future. You’ve done it! 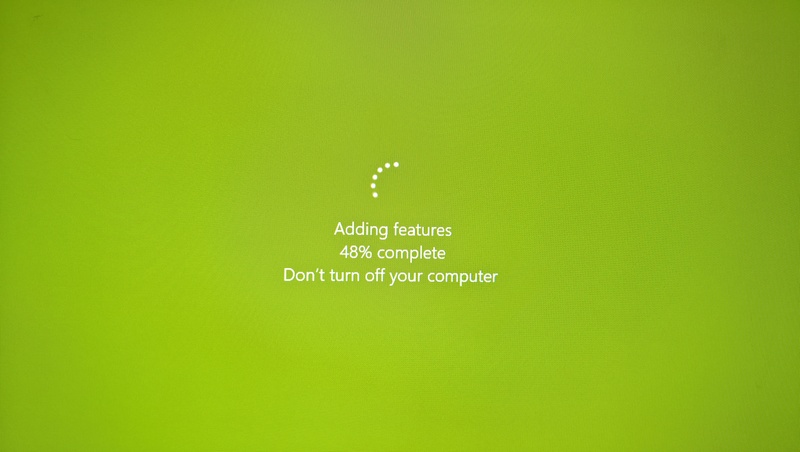 After months of courses at DDLS, weeks of study, days of practice tests and hours sitting in front of test centre computer screens … that final green bar has popped up on your screen. Passed. 700? 800? 1000! Doesn’t matter, that magical word “pass” means you are now a freshly minted, new and shiny MCSE (Microsoft Certified Solutions Expert). Phew! Seriously, the sense of relief flooding through you feels like you’re on top of the world. What next? Tell everybody, starting with the Exam Centre Proctor, then ring everyone important to pass on the big news. Then onto Social Media; Twitter, Facebook, anywhere to spread the news. Facebook … great for keeping up with friends and relatives, but it’s not really a “professional” network. News of your MCSE status shares space with friends dancing in grass skirts, your Mum’s complaint about snails on her lettuces and Grumpy Cat scowling at the world. How do you update your CV, tell others in the industry of your latest achievments? LinkedIn. If you’re not already on it, go to http://www.linkedin.com, create your account and start filling in the details. Companies (DDLS), individuals (Wayne McGlinn), Special Interest Groups (Hamster Rescue), all have a professional presence on LinkedIn. That’s the key word here: professional. You have spent significant time and effort on your MCSE and you want that effort to be viewed and acknowledged by your peers. That MCSE helps open doors, connects you to your peers, even attracts new and better job offers. A good friend of mine, Donald Hester, presented a great YouTube webcast on this very subject recently. Spend 30 minutes watching, then go share your Microsoft Certifications with the IT world, you’ve earned it! Working smarter, not harder, is a goal all Administrators should work toward. Administrators are being asked to do more, with less, and in increasingly shorter time frames. Trying to keep up with new releases of operating systems (OS), patches, cumulative updates soon spirals into a chasing your tail kind of work environment. System Center Configuration Manager (SCCM) is a major tool in an organisation’s arsenal; producing reports, keeping the company OS updated .. lots of work to be done! So, let’s work smarter. Download the System Center 2012 Configuration Manager Servicing Extension from *HERE* The download is an msi file, simply install it and then restart your SCCM Admin Console. Here is a list of Cumulative Updates, version numbers, and release dates. Here’s your Site Version and current updates. There is an interface to “Create Query” to produce Reports of what Client Version your site has. Click on “Create Query” and follow the bouncing ball! And, as a huge bonus, a list of all the latest Blog Posts from the System Center Configuration Manager Team! Kyle’s right you know. Just sitting courses doesn’t mean you’re now ready to go and dazzle the world with your cutting edge troubleshooting skills. You won’t shock and awe prospective employers with those Certificates of Achievement from all your courses. Still, we need to answer Kyle: he didn’t really think he needed to. So, let’s look at 12 Reasons to Certify, number 13 is your take-away and action plan. Certified IT Professionals earn more MONEY. Blunt, but true. And seriously, who wouldn’t like more in their pay packet each month? Experience is valuable, and what a great way to showcase this with your MCSA/MCSE Certification history. Renew and resit Certification exams, keep up to date and current with the latest solutions from Microsoft. Talking to your customers, or even your own company’s CEO/CFO/CIO, carries much more weight. IT Professionals need industry standard Certifications, not generic. Failure is not an option (thanks Lester!). You tried to certify once and failed, so that’s made you wary of trying again. Maybe you need to attend a training course at a CPLS – oh, say the biggest and most awarded CPLS in Australia, DDLS for example. Motivated and experienced MCTs will help you fill in those gaps in your knowledge, and teach you that failing an exam simply means you haven’t passed yet! Indicate to your employer that you would like to validate the training courses you’ve attended, they may even pay for your Certification exams. Certification = Credibility. To pass and become a Solutions Associate/Expert means you really do understand the whole solution, not just a product. Achieve personal goals, and through those personal goals you’ll probably also achieve your company’s goals. Increase confidence, both in you, and within you. Cynics will say “ah, it’s just a piece of paper”. Well pffft to them. It’s my hard earned piece of paper that shows I passed a rigorous test of my understanding of solutions, and it DOES mean something to me. Seriously, even as a 21 year veteran of Certifications, from Novell to Lotus to Check Point to Microsoft; I still get a buzz and a feeling of “yes, I do know my stuff” whenever I achieve or renew my Certifications. Now grab your planning calendar for 2016 and mark that first exam down, then pace yourself from there. You’ll be a Solutions Associate, then a Solution Expert by the end of the year. What, the 12th reason doesn’t make sense? There’s a little lesson there. I honestly wonder just how many people read through each of those reasons, how many said TL;DR? Well, if you did read that far, then if nothing else, the paper your Certifications are printed on will make some really cool origami <g>. Have a great 2016, and a big shout out to my mate, Kyle Rosenthal who appeared in the opening sentences as my “demo”. why corner an MVP? Wait, what is an MVP?? My first post for the year is to explain what a Microsoft MVP (Most Valuable Professional) is, and why we are worth cornering. The origins of the MVP program date back to the early stages of Microsoft’s support and monitoring of the Usenet and CompuServe Developer Forums. One of the independent developers on the FoxPro Forum (Calvin Hsia) kept a list of the number of postings by person, including information on messages both sent and received. Making the Top Ten on Calvin’s List was a worthy achievement, whether a blessing or a curse was cause for discussion in itself! As the story goes, Microsoft saw the list and used it as a way to identify significant involvement with assisting the greater User Community. And so was born the MVP Program. “Today, exemplary community leaders around the world were notified that they have received the MVP Award! These individuals were chosen because they have demonstrated their deep commitment to helping others make the most of their technology, voluntarily sharing their passion and real-world knowledge of Microsoft products with the community.” MVP Blog Website. “Dear Wayne McGlinn, Congratulations! We are pleased to present you with the 2016 Microsoft® MVP Award! This award is given to exceptional technical community leaders who actively share their high quality, real world expertise with others. We appreciate your outstanding contributions in Windows Expert-IT Pro technical communities during the past year. (ed. bolding added to original text) The Microsoft MVP Award provides us the unique opportunity to celebrate and honor your significant contributions and say “Thank you for your technical leadership. At Microsoft, we believe that technical communities enhance people’s lives and the industry’s success because independent experts, like you, help others extract greater value from products and technologies through the free and objective exchange of knowledge. As a Microsoft MVP, you are part of a highly select group of experts that represent technology’s best and brightest who share a deep commitment to community and a willingness to help others. ” extract from the official email notification. Mike Hickman, Director Community Engagement, Microsoft. The MVP Award is earned each year, we cannot rest on our laurels and are continually assessed. So, in a nutshell, if you see anyone wearing an MVP badge at any technical conference, corner them! If you know of classes being taught by an MCT who is also and MVP, sign up! Why? Because we have proven the depth of our knowledge, because we are there to help anyone and everyone, in any way we can. I do not know all the answers, but I guarantee I can get hold of someone who *can* give an answer. My Boss gave me $1500 !! Hang on, let me explain that in a just bit more detail, and maybe stop Mal from having a minor myocardial infarction! Last week, in Chicago, Microsoft held their premier technical conference Ignite. Ignite is a blend of TechEd, MMS and other technical events in a week long geek-fest! From the opening Keynote through to the last session on Friday afternoon Microsoft showcased where they were, and more importantly, where they are going. Mobile first, Cloud first, all week long. Tech Sessions, Breakouts, HOLs and ILLs (Hands On Labs and Instructor Led Labs – courtesy of Learn on Demand Systems), and of course the Expo Hall; a mass of innovative displays and demonstrations from a multitude of IT companies. My role last week was to be an MCT Ambassador and to present a series of ILLs focused on the upcoming release of Windows 10, in particular how Microsoft’s customers will deploy and/or upgrade their current fleets. 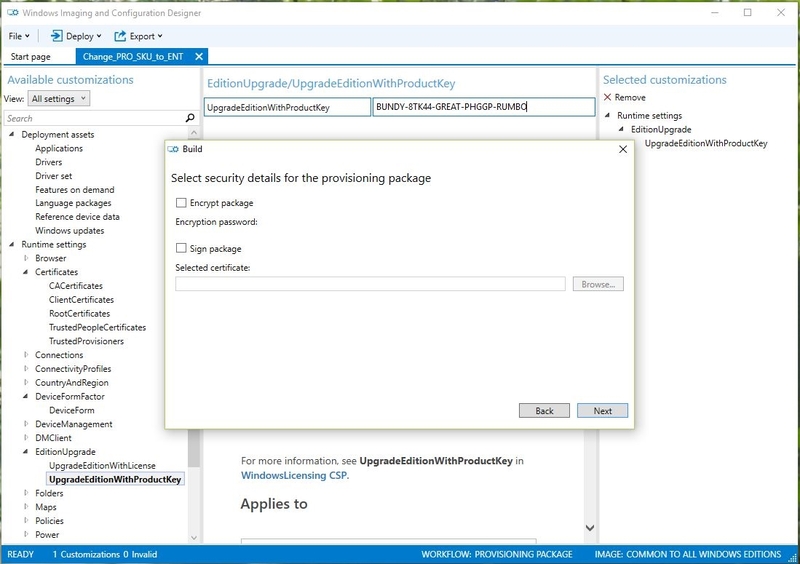 Just prior to Ignite, Microsoft also released their latest preview versions of Windows 10, along with the Windows 10 ADK (Assesment and Deployment Kit). 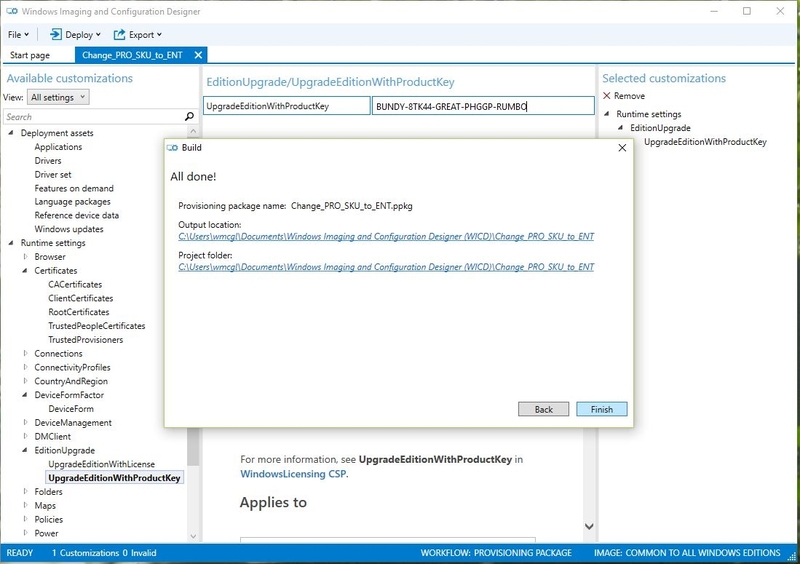 Hidden inside the ADK is a little gem of an application called Windows Imaging and Configuration Designer (WinICD). That brings me back to the (fictitious) $1500 my boss gave me. CYOD (Choose Your Own Device) is gathering momentum; allowing your staff to choose their own device, be it a laptop, tablet, phone or even a desktop to be used in the corporate environment. Fantastic idea, choose any device and any operating system, as long as it’s Windows. The issue, though, is that when you toddle off to Harvey Norman and buy your device, it will typically come with either the “Home” or “Professional” version of Windows 10 (looking forward to after July that is). That means the IT Department has to take your device and then put the Corporate image on there; usually taking at least a day to get everything working smoothly. A fair bit of time and effort. This is where the WinICD comes into play. 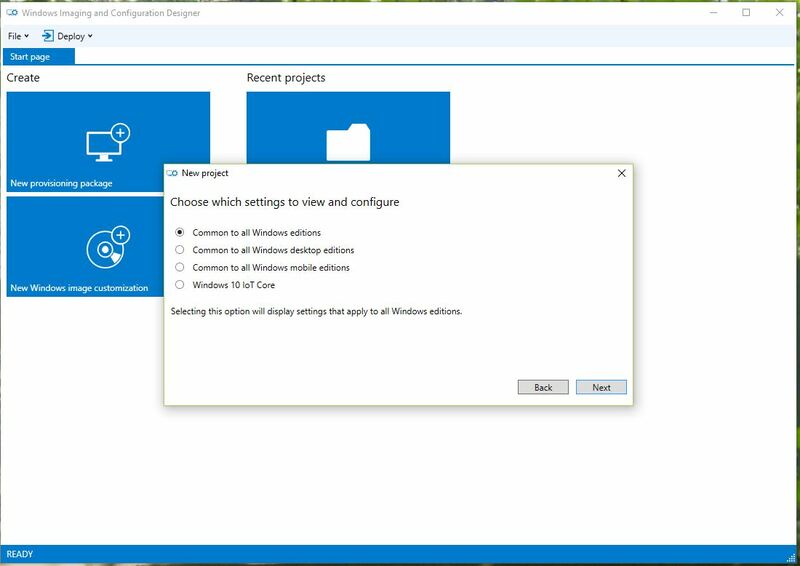 Using the Designer, your Corporate IT professional creates a provisioning package, turning your “Home” or “Professional” version of Windows into “Enterprise” and setting your new device up to work in the Corporate environment. Awesome! 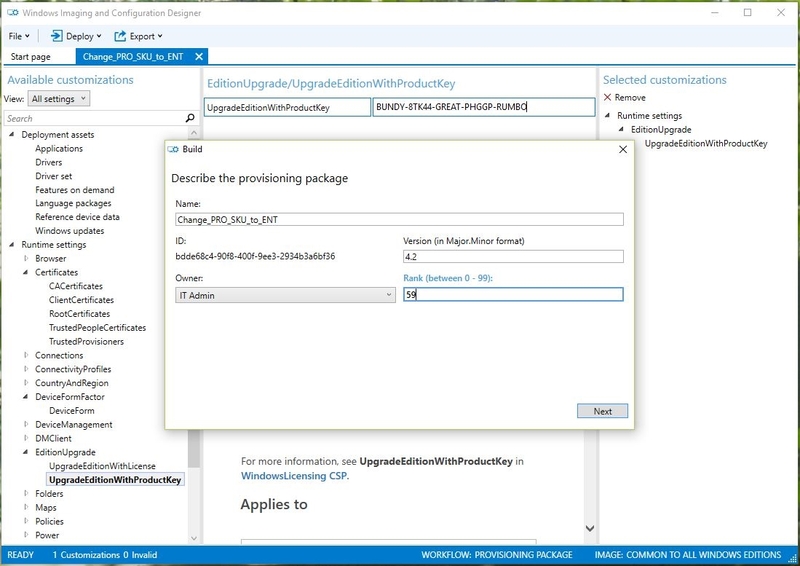 As you’ll see from the screen shots below, it’s a relatively simple wizard that steps you through the creation of the package. Take the package, put it onto a flash drive, or email it, then run the package to provision your shiny new device into the Corporate SOE/MOE. 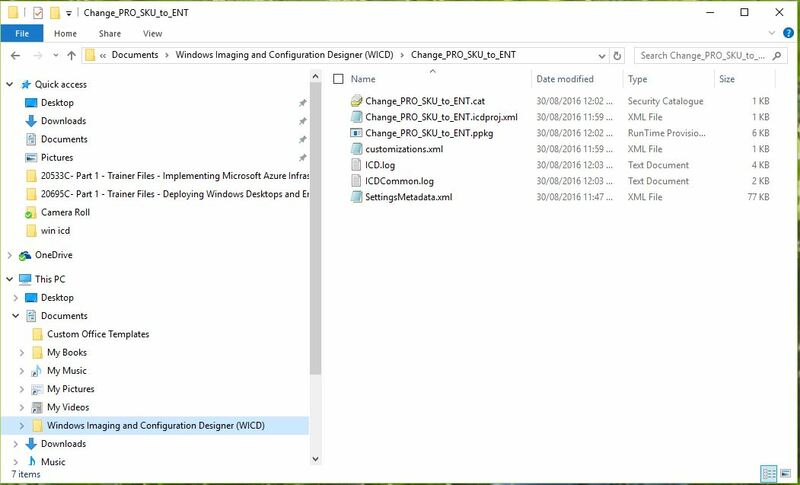 After downloading the Windows 10 ADK, go to the Installers folder and find the “Imaging And Configuration Designer-x86_en-us.msi” and double click. 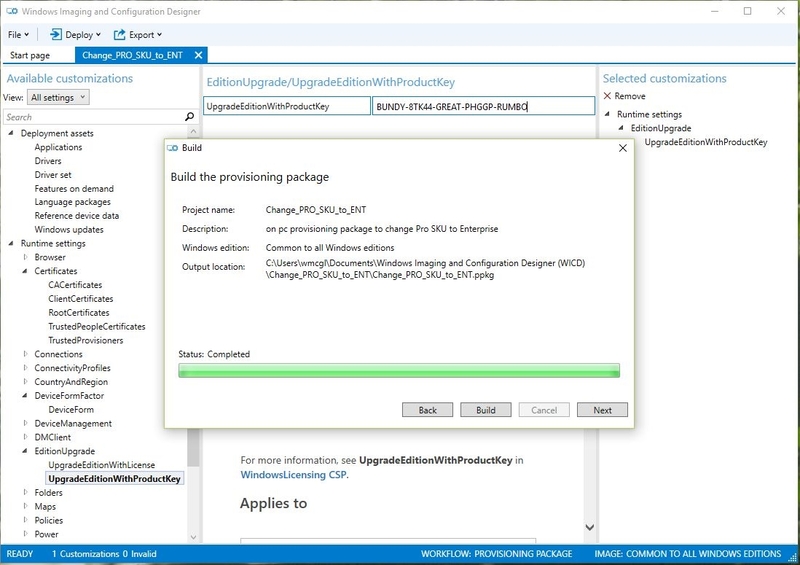 Once the install finishes, start the WinICD and Create a New Provisioning Package, filling in the details and path. Next, select your version; notice the option to also provision a Windows Phone! Love it! This is where all the magic happens. 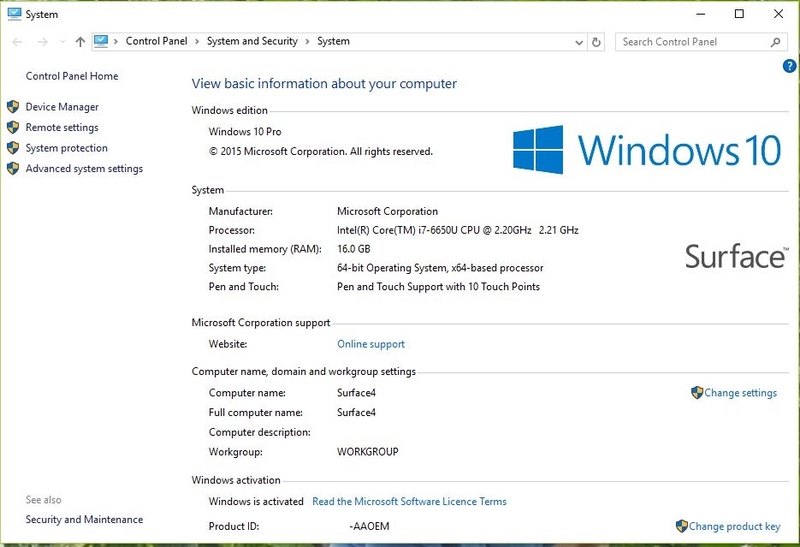 There is a huge list of settings here; from Applications, Drivers, Certificates and most importantly, Upgrading Edition Product Key. 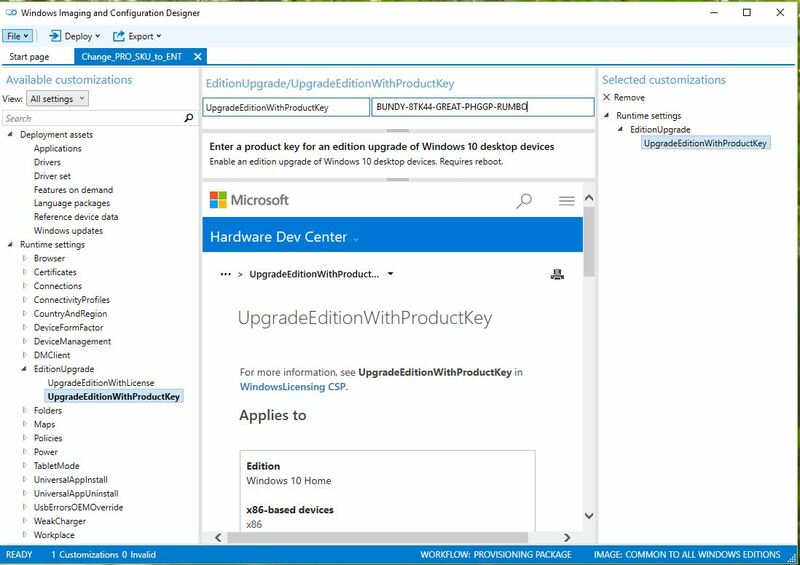 This is where that “Home” version turns into “Enterprise” by inserting the Product Key for the new SKU! Name your package, add in version number, rank and Package Owner. 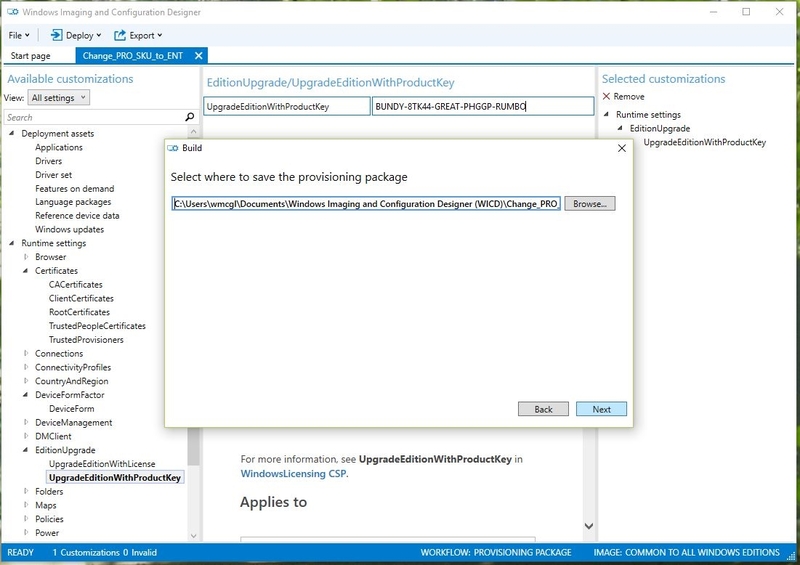 Next, setup security for the package, selecting a certificate at this point means no UAC prompt when running the package – as long as the certificate is trusted. Either using a flash drive, or some other means (floppy disk? <g>) double click the package and accept the UAC. Watch and wait through the various restarts and adding features. Finally, completed. You now have a device that has been reconfigured, provisioned and ready for your work environment. Now go ask your own boss for the money to purchase a CYOD, confident that it can easily be integrated into your corporate environment.